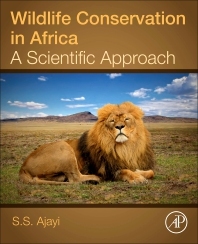 Wildlife Conservation in Africa: A Scientific Approach presents comprehensive management strategies for the consumptive and non-consumptive utilization of wildlife across Sub-Saharan Africa. It describes African economies that are currently dependent on wildlife resources and prescribes strategies for conserving biodiversity in both forests and animals in ecosystems across the continent. The book covers the history and current status of how Africa’s culture, traditions, healthcare and food sources are woven intricately around the local wildlife and resources. It is a necessary resource for researchers and practitioners in wildlife and ecological conservation, but is also useful for administrators and managers of protected areas. Dr S.S. Ajayi joined the University of Ibadan as an assistant Training Fellow in Wildlife and Range Management at the Department of Forestry in 1968. He moved up the academic ladder after his doctoral training, and in 1980, Dr Ajayi became a Professor of Wildlife Conservation at the University of Ibadan. He created the Department of Wildlife and Fisheries Management with separate degree program in Wildlife and Fisheries Management and became the Pioneer Head of the Department of Wildlife and Fisheries Management at the University of Ibadan from 1981 to 1988. He was also the Pioneer Dean for the College of Environmental Resources Management at the University of Agriculture in Abeokuta. Dr Ajayi was team leader of an expert group, which produced the Action Plan for Conservation of renewable natural resources in Nigeria. He was also project leader at the National Science and Technology Development Agency of a research project on studies dealing with the domestication and control of wildlife species and their importance in food production and public health. He was Chairman of the Publicity Sub-Committee of the National Wildlife Conservation Committee and Chairman of the Committee of Wildlife Specialists on the Development of Lake Kainji National Park. Dr Ajayi is the first Emeritus Professor of Wildlife Ecology in Africa, and also holds the title of United Nations Scholar in Wildlife Conservation and Management. His work has emphasized the need to bring the rural population into development policy process by incorporating them into wildlife management institutions and mechanisms, so that they can derive a sense of ownership and thus develop a collective interest in wildlife conservation and environmental sustainability.